Adobe has just released a 2nd public beta version of Lightroom 3 (called Public Beta 2), with some new features, enhancements, and tweaks based on your feedback from Public Beta 1. • It now display the time stamp so you can see the length of each video. • If you click on the camera icon, it launches your default video player and plays the video. • There’s a tweak to Publish Services for flickr.com uploads, where you now have more control over file naming, and you can limit the file size (instead of just the quality). • Three enhancements to the Import Window: (1) You can start importing faster because it no longer renders all the images in folder’s you’re not looking to import; (2) There are more options in the compact version of the Import window, and (3) They’ve made the folder browsing a lot easier using something akin to “Solo Mode,” where you double-click a folder (that has subfolders inside it), and it just shows that one folder. Man, was I psyched to see this one!!!! I tried it this past week, and not only does it work just great, but it is, hands-down, the fastest tethering I’ve ever used—the Raw images appear faster in Lightroom than I’ve ever seen!!! This alone would have sold me. (By the way; at this point it supports tethered shooting from most, but not all, of the latest DSLR cameras from Nikon and Canon). • Enhanced Noise Reduction (the Luminance slider was grayed out in the first public beta, but it’s working now, and it’s really quite incredible). • You now have the option to use a FULL traditional point curve version of Curves right in Lightroom (like the one in Photoshop). • There’s a checkbox for Prepare Previews in Advance, so your slideshow renders all the images first, so it doesn’t choke half way through your presentation (why you would ever turn this checkbox off—I have no idea). • You can now have watermarks on your images here as well (helpful, since more people will be sharing slideshows now). • They added a “Rotate to fit” option and a “rotate cell” command to the new Custom Print Package layout tools (both good additions by the way). That’s a quick look at what’s new in LR3, Public Beta 2. Terry White did a great video touching on all the new enhancements and features over at his Create Suite Podcast, and if you’ve got a minute, I’d definitely check it out right here. To download the new free Lightroom 3, Public Beta 2, visit Adobe Labs (here’s that link). Last week, Vincent Versace was up in Portland visiting us here at onOne Software so we took him out to the Oregon Coast to see what we could photograph. We ended up with some great shooting weather – about 50 degrees and mostly cloudy and most importantly, no rain! Along for the shoot were senior product manager Dan Harlacher, Brian Kraft (vp sales), Vincent and me. If you’ve ever wondered what it’s like to spend a day shooting with Vincent, now you can see. Brian Kraft shot a little video along the way and put it up on Vimeo. I thought it would be fun to share here. Just a warning though, this may be a side of Vincent many of you have not seen before. He was very heavily under the influence of Gummy Bears early in the day. Evidence of why you should keep them out of the reach of your kids. Nikon has released Capture NX2 v2.2.4 for Mac. The new version adds compatibility with Mac OS X 10.6.2 and fixes bugs. Capture NX2 v2.2.4 for Windows was released last month. Nikon has released Camera Control Pro v2.7.1 for Mac and Windows. This update makes changes to the ISO Auto, Focus Tracking with Lock-On and Dynamic AF Area settings to bring the program into line with the options available within the D3 and D700 with the latest firmware installed. 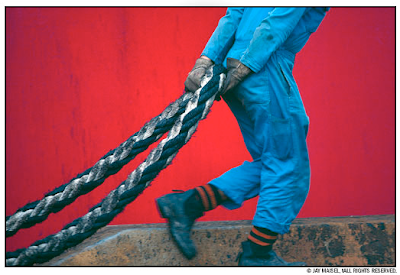 Jay Maisel talks about his passions Light, Color, Gesture. Nikon has released new firmware for the D300S, D700, D3 and D3X. The updates is for all four models and support for 64GB CompactFlash cards; other refinements vary by the camera. Follow a link below for more information and to download. MELVILLE, N.Y. (December 9, 2009) – Nikon Inc. today announced two new NIKKOR optics that deliver the pinnacle of image quality for professional photographers who demand super telephoto capabilities. The new, fast aperture AF-S NIKKOR 300mm f/2.8G ED VR II super telephoto lens and AF-S Teleconverter TC-20E III deliver images with stunning edge-to-edge sharpness and clarity throughout the frame. Continued refinements and new technologies such as Vibration Reduction (VR) II and optimized autofocus (AF) modes in the lens enhance functionality and improve performance for discerning FX and DX-format digital SLR photographers. Whether photographing nature in the wild or the battles at a line of scrimmage, the 300mm f/2.8 is an essential tool for photographers who require the highest level of image quality for publication and printing. This 300mm lens effectively leverages a host of Nikon core technologies, including Nikon VR II image stabilization, specifically engineered for each lens design for maximum performance. VR II instills confidence by counteracting image blur introduced by camera shake and telephoto magnification, allowing users to shoot up to four shutter speed stops* slower than otherwise possible, overcoming many of the challenges of handheld shooting. If tripod shooting is preferred, the Tripod Detection Mode will detect and compensate for tripod-specific vibrations. This professional lens is constructed of die-cast magnesium for maximum durability and is strategically sealed to resist dust and moisture, with protective Meniscus glass to safeguard the lens’ front element. The optical formula features three Extra-low Dispersion (ED) glass elements for superior sharpness, color and image quality, while minimizing chromatic aberration. Additionally, an aspherical element is used to promote image integrity throughout the frame, suppress coma and minimize distortion. The lens also features Nikon’s exclusive Silent Wave Motor (SWM) technology which enables high-speed autofocus performance with exceptional accuracy and powerful, super-quiet operation. Nikon’s exclusive Nano Crystal Coat prevents instances of ghosting and flare for even greater image clarity. The AF-S 300mm f/2.8 lens features a host of professional focusing features that further enhance functionality. Photographers can now select from three focus modes to match shooting conditions, including manual mode (M) and autofocus with manual priority (M/A) mode, and the new A/M mode. The A/M mode enhances AF control with fast, secure switching from automatic and manual focus to adapt to personal shooting preference and techniques. Additionally, users can also activate the AF Recall Mode at the press of a button that allows for instant return to a predetermined point of focus to capture anticipated shots confidently. Nikon’s professional grade teleconverters, including the new AF-S TC-20E III are ideal companions to the new NIKKOR 300mm f/2.8 and other select lenses to create an affordable and portable gateway to extended telephoto photography. The new TC-20E III effectively doubles the focal length of select lenses, and is the world’s first teleconverter to feature an aspherical element to virtually eliminate coma and other aberrations even at wide apertures. The AF-S DX NIKKOR 300mm f/2.8G ED VR II lens is scheduled to be available at Nikon authorized dealers with an estimated selling price of $5,899.95. The Nikon AF-S Teleconverter TC-20E III will be available for estimated selling price of $499.95**. Availability of both products is scheduled to begin in January, 2010. For more information, please visit www.nikonusa.com. With a comprehensive assortment of FX and DX-format lenses and focal lengths, from the new ultra-wide 10-24mm to the super telephoto 600mm VR, Nikon photographers have come to rely upon the NIKKOR core technologies that contribute to their optical superiority. NIKKOR is the brand name for Nikon’s photographic lenses, which was created by adding an “R” to “NIKKO”, an abbreviation of Nippon Kogaku K.K., the original company name of Nikon Corporation at the time of its founding. In 1933, Nikon marketed its first camera lens under the NIKKOR brand name, the “Aero-NIKKOR” for aerial photography applications. Since then, NIKKOR has been used as a brand name for Nikon’s lenses that symbolizes durability, high image quality and optical excellence. Nikon, At the Heart of the Image™. Nikon Inc. is the world leader in digital imaging, precision optics and photo imaging technology and is globally recognized for setting new standards in product design and performance for its award-winning consumer and professional photographic equipment. Nikon Inc. distributes consumer and professional digital SLR cameras, NIKKOR optics, Speedlights and system accessories; Nikon COOLPIX® compact digital cameras; COOLSCAN® digital film scanners; 35mm film SLR cameras; Nikon software products and Nikon sports and recreational optics. For the second consecutive year, Nikon D Series digital SLR cameras are recognized as “Highest in Customer Satisfaction with digital SLR cameras, Two Years in a Row, Tied in 2008.” according to the J.D. Power and Associates 2007 and 2008 Digital Camera Usage and Satisfaction StudiesSM. Nikon Corporation, the parent company of Nikon Inc., recently celebrated the 50th anniversary of its legendary F-mount lens-mounting system. Only Nikon has sustained an original lens mount for such an extraordinary period, ensuring that photographers can continue to leverage their previous investments while still taking advantage of new innovations. For more information, dial (800) NIKON-UX or visit http://www.nikonusa.com, which links all levels of photographers to the Web’s most comprehensive photo learning and sharing communities. **Estimated selling price listed is only an estimate. Actual prices are set by dealers and are subject to change at any time.